The Kameleoon results page allows you to view and analyze the results of your A/B tests. Discover its main features! Discover our results page on video! To access the results page of an experiment, log in to your Kameleoon back-office. In the sidebar, go to the “Dashboard” of your A/B tests or personalizations. On the home page of your personal space, you will find the results of your last A/B test and/or your last personalization. Click on the blue block to access the results page of the experiment, or on “All tests” to access all the tests and pick another one. The Dashboard page gives you access to the results of all your A/B tests and personalizations. Note: You can also create a new test from this page by clicking “New Test” at the top right of the page. A search bar allows you to easily find an experience by entering his name. Filters and sorting are also available so you can easily find the experience you are looking for. On this card, you will find an overview of the main results and essential information about the experience: name, associated website, tags and status (draft, online, paused, deviated or stopped). To access the results of the experiment, hover over the card and click on the “See results” button that appears. Several options are there to adapt the display of results to your needs. Filter your results, limit them to a particular date range, choose the type of view of visits and conversions, or switch to Bayesian view. Use filters to limit the display of results to visitors meeting specific criteria. When you apply a date range to the display of your results, the page only takes into account results within that range of dates. To set a date range, click the calendar at the top of the page. A pop-up opens and allows you to set the start and end dates of the date range. Start by setting a start date to your date range. To do this, click on the first zone and in the calendar that opens, select the date of your choice. Click the second date box to set an end date to your date range. By default, the calendar offers a monthly display: all the days of the month are displayed. To change months, click on the arrows. To switch to the annual view, click on the month at the top of the calendar. The calendar now displays 12 months and the arrows allow you to change the year. This is particularly useful for quickly selecting a remote date. Click on a month to return to monthly view and view the days it contains. Note: The dates before the launch of your test have no data, they can not be selected. They appear dimmed in the calendar. Click on the day of your choice to confirm the choice of date. To further refine your date range, set a start time and an end time. Click on the time zone to bring up the clock setting. Fill in the hours, minutes and seconds directly or click on the up and down arrows to set the time you want. Note: A day starts at 00:00:00 and ends at 23:59:59. To delete a set date range, simply click on the accompanying cross. The results page will show the results of all the set date ranges. Conventionally, the view per visit will count each visit regardless of the visitor. Viewing by visitor, on the other hand, will count unique visits. For example, a visitor who visits the site three times will be counted as three visits in “View per visit” mode and as a single visitor in “View per visitor” mode. When you change the display mode, the results of the page are recalculated according to the display mode you have chosen (number of visits or visitors). Improvement and conversion rates, in particular, are highly likely to change. A second drop-down menu allows you to choose between a display of total conversions and a display of converted visits. If “All conversions” is selected, a unique visitor who converted 3 times during the same session will be counted as 3 conversions. On the other hand, if “Converted visits” is selected, this same visitor will be counted as a converted visit, regardless of the number of conversions during the session. By default, the results of your test are presented to you according to a Frequentist analysis of data. Kameleoon also offers you another statistical method: the Bayesian one, which is based on the the deduction of the results’ evolution according to previous trends seen on this test and/or on similar tests. For the details of the Bayesian statistical method, and which one is best for you, check out our dedicated articles: Frequentist or Bayesian Approach? and Results according to the Bayesian method. To switch the Frequentist results display to Bayesian, click the switch button to the right of the display settings to set it to “ON”. At the top of the results page, to the right of the main information about the experiment, is the menu of general actions on the page. This action updates all the data on the page without reloading the page itself. You are thus sure to consult the most recent data! Reset data if you want to delete all the test results. To reset the data of a test is to start the test a second time, all the results are reset. Warning ! This action is irreversible! It is offered to the user only if his role authorizes it, and a confirmation pop-in secures your data in case of an uncontrolled click. In the drop-down menu, choose a display of the results by goal or by variation. The presentation of the results in the graphs and tables will then be modified: the displayed curves will represent either the goals or the variations. In the same way, each table will correspond either to a goal or a variation. By modifying the reference variation, the results (and especially the improvement rates) will no longer be calculated according to the original page of your website but according to the variation of your choice. To set a reference variation different from the original, switch the button to “ON”. In the drop-down menu that appears, select the variation of your choice from the variations of your test. 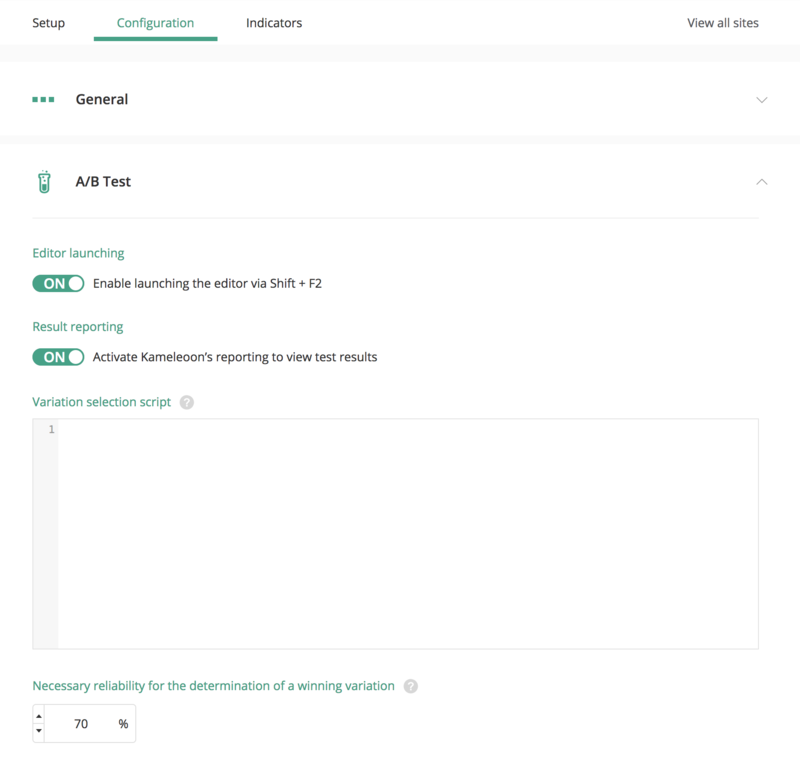 If you only want to look at certain variations of your test, this option allows you to hide a selection of variations from the results page. Click on the switch button to put it on “ON”; in the drop-down menu that appears, select the variation(s) you want to hide from the page. In the same way as with variations, you can hide the goals you do not want to see. Click on the switch button to put it on “ON” then, in the drop-down menu that appears, select the goal(s) you want to hide from the results page. Associated targets tables will not be displayed anymore. You can check or uncheck all the goals at the same time in the pop-in. We offer a default view, but you can set your own display according to your needs. You can then save it so you will find the same display on your next visit. It is also possible to load a predefined view to apply it to the page. To memorize the current display, just name it and, if you wish, set it as default view for this test. By checking this option, you will find this display with each new consultation of the results of this test. You can apply to your page previous display settings set up on this same page. Select a view from the drop-down menu and, if desired, set it as the default view for this test. To the right of the selection field you will find a “trash” icon to delete a previously saved display. To do so, select the display and click on the trash. Gone with the wind! Configure alerts to be informed by e-mail of the evolution of your results. First, enter the e-mail address to which you want to receive the alerts. Two predefined alerts are directly available, but you can also set custom alerts. Choose to be informed when your test results are ready or when a variation is identified as a winner on the main goal. Click on the switch button of the alert to put it on « ON » and activate it. Custom alerts can be set on any of the data available in your results. Just click on “Custom alerts” to set up. In the first drop-down menu, select the data for which you want to be informed of the evolution: improvement rate, conversion rate, reliability, number of visits, visitors or conversions. An alert will be sent to you as soon as the value reaches the threshold you set. Choose whether this threshold should be higher or lower than the value you want and fill in this value. You can also be alerted when the value of the measured data increases or decreases in proportions that you set. Finally, in the last drop-down menu, define the variations or goals to which the alert applies. If you have chosen to be alerted about the improvement rate, the conversion rate or the number of conversions then you will define here the concerned goals. In other cases, you will have to choose among the variations of your test. The “Actions” menu allows you to print the results of your experiment. Two options are available: the detailed printing of a part of your results or the printing of a global summary. In the first drop-down menu, select the graphs you want to print. All the graphs available in your results page are also available here. In the second drop-down menu, select the goals or variations for which you want to print the tables. If your results display is set on “Goal view”, the drop-down menu will let you choose the goals you want to print. If the display is set to “Variation view”, it will allow you to choose which variations you want to print. The table for the goal/variation. The results of your tests can be exported under two different formats: Excel format and PDF. To export your results in an Excel file, select “Excel” from the drop-down menu. You can choose which type of data to export and your preferred display of Excel files: tabs per variation, tabs per goal or all data in the same tab. Then click on “Export” to save the Excel file containing the result tables. When opening the table, the first tab, “Info”, reminds you of the main information about the test: title, date range, and targeting. The following ones depend on the view you have chosen. All data is displayed and each tab is a variation. To export your results in PDF format, select “PDF” from the drop-down menu. Then select the information you want to export in the same way as for printing. The results of a test can be shared by e-mail or by sending the URL of the page directly. The page thus shared only allows the consultation and does not give access to the editing options, the setting of the page or the various actions. To share the results page by e-mail, select “Send report by e-mail” from the drop-down menu. In the text box, enter up to 10 e-mail addresses separated by commas. To delete an e-mail address, click on the cross next to it. Then click on “Share” to send a report containing the results to the e-mail addresses. To get a link to share your test results, select “Share URL of this page” from the drop-down menu. Secure access to this page with a password. Access to the results page from the link will only be possible with the password of your choice. Set this password by entering it in the text block. Click on “Copy and Close” to confirm the creation of the link, copy it to the clipboard and close the pop-in. At the top of the results page is the main results of your test. You will be able to see at a glance which variant of your experience is considered a winner. The original variation is the recommended one. In this case, we advise you to wait until the data is sufficient to exploit the results. Note: In the “Actions” menu of the results page, you can define an alert that will inform you by e-mail as soon as the results of your test are reliable. Check out our article Actions on the results page to learn how to set up an alert. On the left of the main results block is the name of the winning variation and the name of the primary goal (the goal for which the variation is winning). When a variation outperforms on the primary goal and its reliability rate is sufficient, then it is considered as winning for the primary goal. Have a reliability rate higher than the minimum set. By default, a “reliable” variation is a variation whose reliability rate is greater than 70%. Nevertheless, you can change this rate by going to the configuration page of your website. When the variation having the best improvement rate on the primary goal has an insufficient reliability rate, another variation is then recommended. The recommended variation is the one offering the best improvement rate among the reliable variations. By default, a “reliable” variation is a variation whose reliability rate is higher than 70% (you can change this rate by going to the configuration page of your site). Variation 3 (7% improvement, 90% reliability). Variation 1, while being the best performer, can not be considered a winner because its reliability rate is too low. The recommended variation is then the variation which, among those with a sufficient reliability rate, offers the best improvement rate: variation 2. When none of the variations with a higher conversion rate than the original has a sufficient reliability rate, the original variation is a winner or recommended. In this case, the improvement rate and the reliability rate are not measured on the original, only the conversion rate is indicated. In this part of the main results block, you will also find a reminder if filters or date ranges are applied to your results page, as they may change the results. In the center of the main results block, the results of the winning or recommended variation are displayed. The reliability rate of the variation. You will find the details of the results in the results table, further down the page. The number of visitors tested. The comparative view allows you to compare, on a spider web graph, the target improvement rates set on the test. The comparative view is only available if at least two goals are configured on your A/B test. To display the comparative view, click the “Comparative view” tab at the top of the chart area. At the top left of the chart area, two drop-down menus allow you to select the goals and variations you want to display in the comparative chart. To choose the goals you want to display on the comparative view, open the first drop-down menu by clicking on it. The goals set on the experiment appear in the drop-down menu. By default, all goals are selected and therefore appear on the comparative graph. To hide or show goals, deselect and select them by simply clicking on them. Note that at least two goals must be selected for the comparative view to appear. Click “Uncheck all” to deselect all goals or “Check all” to select all. To choose the variations you want to display on the comparative view, open the second drop-down menu by clicking on it. All variations are displayed in the drop-down menu. By default, all active variations are selected and appear in the comparative view. 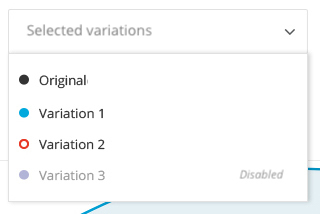 The deactivated variations are neither selected nor displayed. To hide or show variations, deselect and select them by simply clicking on them. 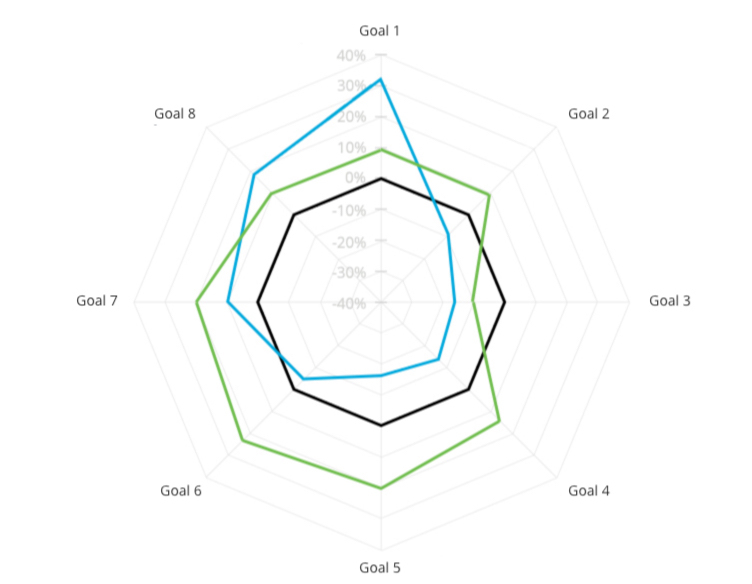 The comparative view displays, on a spider web graph, the rate of improvement of the variations on each goal. The original variation, shown in black, is the reference. You can quickly see which variations outperform or underperform on different goals. We can see, on the example above, that the displayed variation (in blue) is more powerful than the original (in black) on the goals 1, 7 and 8 but underperforms on the other ones. 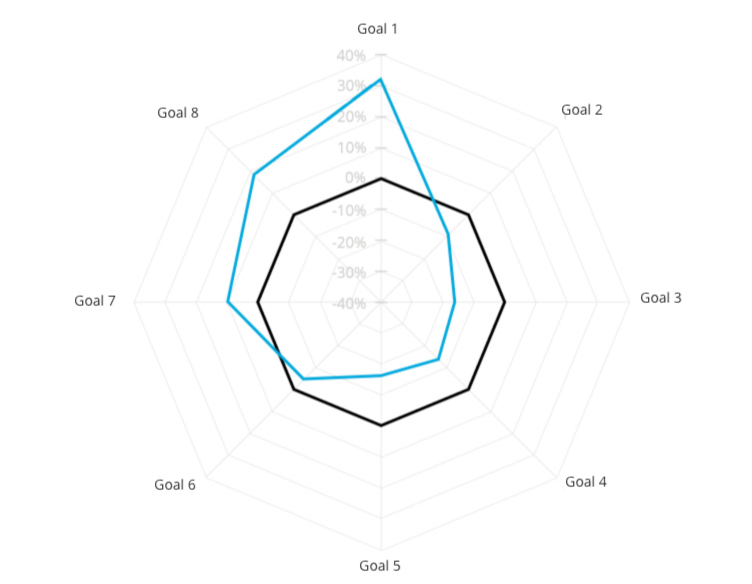 To visualize the improvement rate of a variation on a goal, hover with the mouse the point of intersection between the axis of the goal and the curve of the variation. A dot appears to highlight the location when hovering with the mouse. A pop-in displays and indicates the improvement rate of the variation on hover, towards the goal on hover. Click on one of the intersection points to highlight the intersection points of the variation on all goals and display the details. 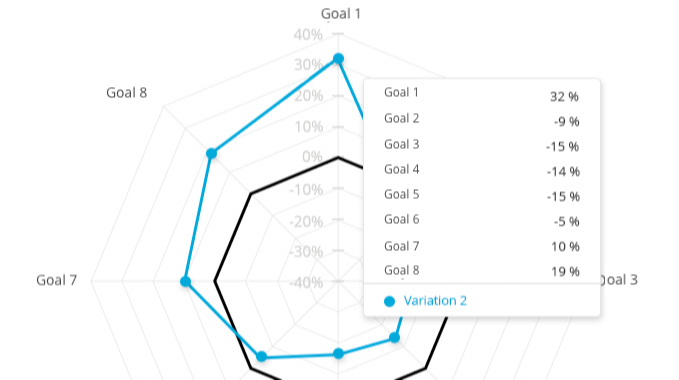 In the tooltip that appears, you find the improvement rate of the variation on each of the goals displayed in the graph. Click outside the tooltip to close it. To see the improvement rates of the variations displayed in the graph for a particular goal, hover over the goal name with your mouse. The graph allows you to visualize the evolution of the different data of the results page over time. The x-axis displays the time scale, the y-axis the value of the data. To view the comparative view, click the “Graphs” tab at the top of the graph area. 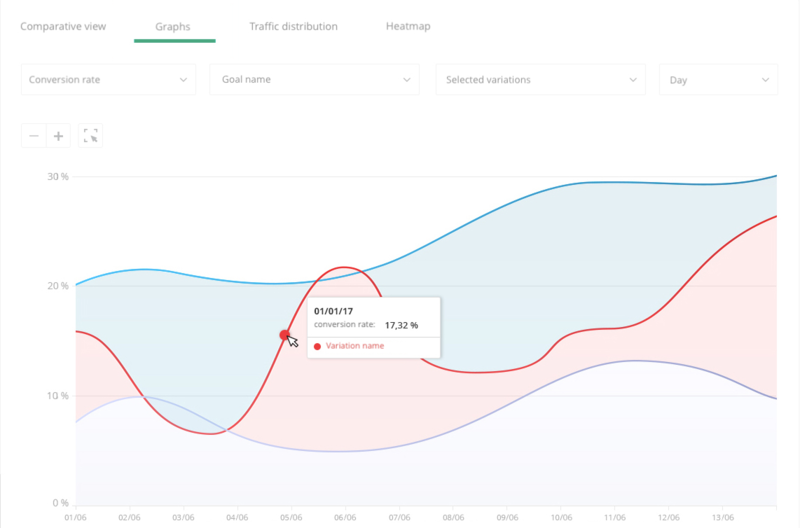 The display of the graph differs depending on whether you have chosen the view per variation or per goal in the “Actions” menu of the results page. To learn how to choose between the two types of views, see our article dedicated to actions on the results page. If you have set the view per goal (default view), the graph will represent a goal and each curve will represent, for this goal, the evolution of the data of a variation in time. On the contrary, with the view per variation, the graph will represent a variation and each curve, for this variation, the evolution of the data of a goal in time. 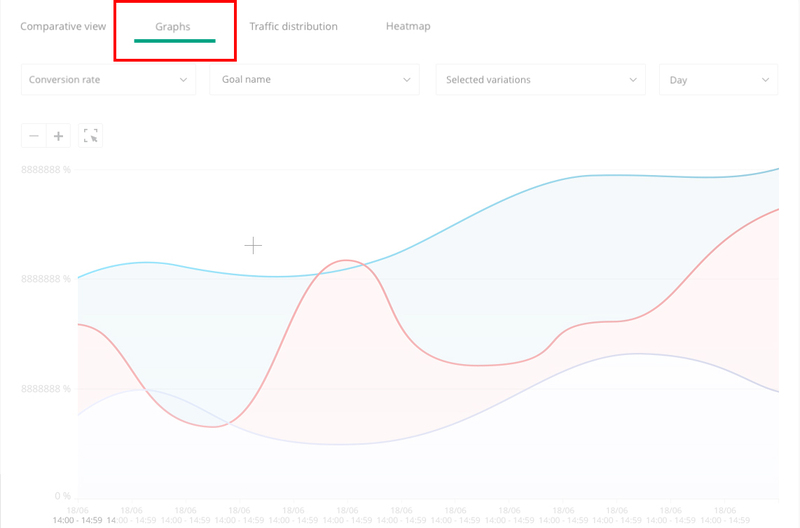 In this article, we will take as an example a graph displayed according to the view per goal (view by default). The fineness of grouping data. By default, the data displayed on the graph is the conversion rate. To select another data, click the first drop-down menu to display the different types of data available. Just click on the type of data you want to display in the graph to select it. In the second drop-down menu, select the goal for which you want to view the results. The curves of the displayed variations will present the results on this goal. Note : If you have chosen a view per variation, you will select from this drop-down menu the variation to display. Like everywhere else on the results page, the main goal is identifiable by the little black star that accompanies it. In the third drop-down menu, select the variations to display in the graph. Click on a variation to select or deselect it. Two buttons also allow you to select or unselect everything. A selected variation is accompanied by a full colored circle, a deselected one by an empty colored circle and a disabled one is grayed out and displayed at the end of the list. In this example, variation 1 is selected, variation 2 is not, and variation 3 is disabled. Each selected variation will be represented by a curve of the color assigned to the variation. Different options for grouping data are available in order to adapt the display of your results to your test duration or the date range you set. By selecting “Month” from the drop-down menu, the x-axis on the graph is graduated from month to month and each month is a point that groups together all the data measured over the month. The same goes for “Weeks”, “Days” and “Hours”. You can choose the most relevant display for your test. If, for example, your test runs through a period of 2 months, it is better to choose a grouping by weeks. A display per month would not have sufficient finesse (only 2 points) and a grouping by days would have excessive finesse. On the other hand, if you are interested in a range of dates that runs through 2 weeks, a grouping per day is recommended. The evolution curve presents the evolution of data over time. The graph above represents the evolution of the conversion rate (y-axis) over time (x-axis). Each curve represents one of the 3 variations displayed and the results are those related to Goal 1. The graduation of the time scale is made per day. On hover, the detail of the results appears. The name of the hovered variation. By clicking on this point, the tooltip displays the value of the data for each variation on that date. Click elsewhere on the page to close the tooltip. A free zoom tool (3). Click the “+” or “-” button to zoom in or out on the graph. The zoom – reduces the scale of the ordinate axis (data value) and the zoom + enlarges it. The use of zoom has no impact on the x-axis. The displayed date range and scale remain unchanged. When + and – zooms are at their maximum, the buttons are dimmed and can not be used anymore. The free zoom tool allows you to freely zoom in on the graphic area of ​​your choice. To define the area you want to zoom in, click in the grayed area and while holding your mouse click, drag the mouse diagonally to define a rectangle on the area you want to zoom. The zoom area thus defined appears in light. When the area meets your needs, release the click. Two buttons appear at the bottom right of the rectangle. Click on the validation button to confirm your selection and refresh the graph according to this one or click on the cross to cancel your selection and exit the “free zoom” mode. By validating your selection, the graph view adapts. The selected area stretches to fill the entire chart area. To exit the “free zoom” mode and return to the default view, click the free zoom button again. The tables of results allows you to consult the details of your results, per variation or per goal. Ventilation tools, filters and customized display are there to help you read the results of your test. Learn how to use them and you’ll become an expert! The result tables are located at the bottom of the page, under the graph area. By default, the table of the main goal is unfolded, its results are directly visible. The tables of secondary goals are folded; just click on it to display their content. The display of the tables differs depending on whether you have chosen the variation or goal view in the “Actions” menu of the results page. To learn how to choose between the two types of views, see our article about the actions on the results page. If you have set the view by goal (default view), each table shows the results of each variation for a goal. Conversely, with the variation view, each table presents the results of each of the goals for a variation. This article will treat the results tables from the view per goal. The status of the goal (active or inactive). Click on the header of a table to fold or unfold it. Unlike a filter tool, breakdown allows you to view the results in more detail. Click on “Breakdown” above the table. You can display the details of your results by browser, operating system, days of the week, etc. Choose your breakdown and click on the “Validate” button. You can also apply this breakdown to all goals by checking the corresponding box below the drop-down list. Note: Only available breakdowns are clickable. A padlock may appear in front of some of them to indicate that they are not available. After validation, you obtain a display of the results corresponding to the selected breakdown. In this example, the selected breakdown concerns the browser. The results are distributed according to the different browsers used by your visitors. Click on the variations to display the results associated with them, according to the chosen breakdown. To do this, click on the arrows on the right of each variation line. The results then take place taking into account the chosen breakdown. You can hide these details again by clicking on the same arrow. If you want to delete a breakdown to return to the default view, click on the cross in the label of your breakdown. You can also visualize the data with a graph. It only concerns the goal presented in the table. To do so, click on the “Display graph” button, just to the right of the “Breakdown” one, in order to make the section appear. When you activate the graph display, the “Display Graph” button changes to “Hide Graph”. To learn more about viewing and adjusting the graph, you can visit our “Evolution curve” article. The name of the winning variation (for the goal) appears in bold so it is immediately recognizable. When view per goal is selected, each table displays the results related to a goal. Each line represents a variation and each column a data. Note: With variation view, each table presents the results related to a variation. Each line represents a goal and each column a data. To scroll the table and view the following data, click the arrow on the right of the table. Those that are unchecked do not appear. Still in the settings menu , you can change the order of the columns by clicking on . With click-and-drop, you move the labels to rearrange your table. You can re-switch to the “choice” mode by clicking on . Note: The proposed data depend on several criteria: the type of goal (for example, for the goals of the “Transaction” type, the data “Average basket value” is proposed); the type of view (for example, in the view per variation, the “Number of visits” column is never displayed. in ascending order if the arrow is pointing upwards. For example, if you click on the title of the column “Number of visits”, the variation presented first will be the one that counts the most visits, and so on until the variation that counts the least and is at the bottom of the board. Only the variation column is not clickable. If you save the display settings (via the “Actions” menu), the presence/absence of the columns and their order will be saved. In this way, you will find the same display on your next visit. For more information, see our article on saving display settings. All columns in the result tables, except for the variations, have a title with a tooltip. This tooltip appears on hover. The column headings are explained by these tooltips. You can also consult our Results page lexicon to find the definition of all key terms. We will only detail here the data that presents a double level of information: the improvement rate and the indicator of reliability. 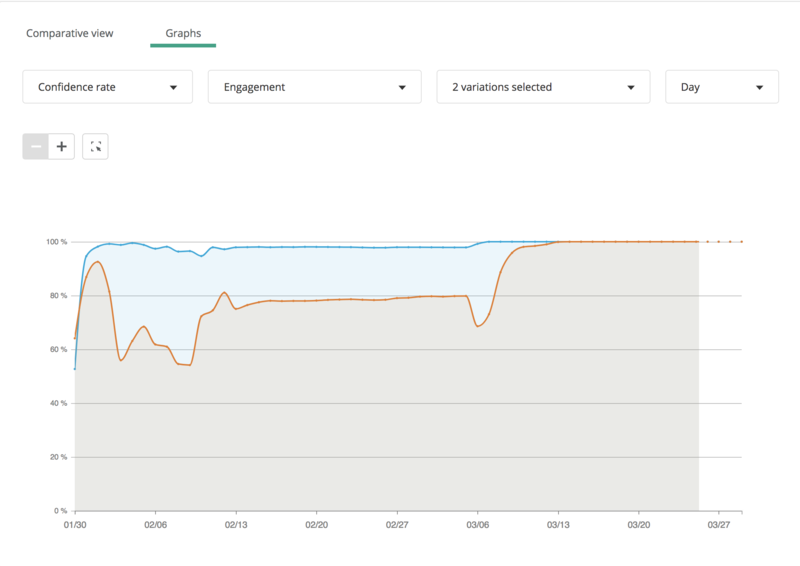 This column shows the improvement rate of the conversion on your goal. It is always in comparison to the original (which always has an improvement rate of 0). It therefore reflects the improvement of the conversion rate in comparison to this reference. The percentage in bold just above the color block corresponds to the average improvement rate observed during previous visits. Here, this rate is 10%. In other words, on this goal, the test revealed a 10% improvement in conversion over the conversion rate of the original. On hover, two percentages appear: this is the confidence interval. It indicates the interval in which your actual improvement rate may be. In the example above, the improvement rate has a 95% chance of being between the minimum (8%) and the maximum (12%). The colored rectangle is also an indicator: its shape indicates the possible interval in which the improvement rate is, and visually represents this interval with respect to zero. The reliability rate associated with it is of 95%. In the example below, the improvement rate has a 95% chance of being between -1.88% and + 2.32%, so almost as much probability of being negative as positive, which is represented by the shape of the blue rectangle. This indicator represents the probability (in percentage) that a variation would beat the original. The test is only reliable if it has been applied to a sufficiently large amount of visitors. If the number of tested visitors is too low, the test loses its value. Your test is not considered complete until this reliability rate stabilizes over time. A visual indicator reflects the stabilization of the rate: if the 3 boxes light up, your rate is stable and your test is over! Note: This indicator makes it possible to visualize, immediately and very easily, the evolution of the reliability. Just watch the boxes. However, you can also consult the graph showing the evolution of the reliability over time (by selecting “Reliability” in the “Graph” section of the block). In this example, the first and third variations have their three boxes illuminated: their confidence level is stabilized, their results are reliable. The second variation, on the other hand, has only one illuminated box. This means that you have to wait until your reliability level stabilizes. An icon to the right of each variation name allows to open the variation menu with a simple click. Four actions are then possible. This icon allows you to view the variation. Click to open a new browser tab showing the simulation mode, directly applied to the variation. 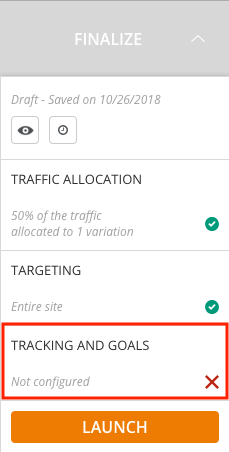 Click this option to display the traffic allocation pop-in. You can then modify the allocation. There are two ways to do this: either use the cursor while holding the click, or double-click on a percentage to replace the value manually. You can also deviate 100% of the traffic to the concerned variation. This means that all visitors will see this variation. A pop-in opens when you click. You can then confirm the deviation or cancel the action (and change nothing). If Variation 1 is the reference, the option is disabled for this variation; however, it is available for the original and for all other variations. Note: By default, the box of the original is checked and it is not for variations. Checking a variation identifies it immediately as the only reference variation. Note: There can only be one reference variation. If you uncheck a variation, the original automatically becomes the reference. The improvement rates are automatically recalculated according to this new reference variation. You can also click on the variation line to deploy the data associated with it. The side panel of the results page allows you to view the settings of the test for which you are viewing the results and making changes to it. You will find this panel on the right side of the page. At any time, an arrow allows you to display or hide it. You also find here a certain number of actions. When hovering over the name of the test with your mouse, arrow(s) appear and allow you, by clicking on it, to display the results of previous or next test. To change the status of your test, click on its current status and select from the drop-down menu the status you want to assign. Click on the icon to open the experience simulation tool. To learn how to fully use the simulation tool, check out our dedicated articles. Click on the icon to open your experience in the graphic editor and thus be able to modify it. Click on the icon to permanently delete your experience. Warning ! This action removes the test and its results and is irreversible! In the side panel, click on “Key Information” to view and edit the main information of your A/B test. Name of the main goal. Click on “Edit” to display the pop-in allowing you to change the name of the test, its description and the tags associated with it. In the side menu, click on “Goals” to view and edit the goals related to your experience. All goals related to the experience are listed here. The first one of the list is the main goal of your test and is identifiable by its full blakc star. Hover over the name of the goal brings up an information icon. Its description (or its configuration if there is no description). Click “Edit” to change the order in which goals are displayed, to dissociate goals, or to associate new ones. At the click on “Edit”, a pop-in with the list of related goals opens. When you hover over a goal with the mouse, it becomes gray and two icons appear. The icon allows you to dissociate the goal and the icon indicates that you can edit its position in the list. To dissociate a goal, simply click on the dissociation icon . A pop-in asks you to confirm your choice. To change the display order of the goals, move them one by one using drag and drop: click on the goal you want to move and, while holding the click, drag it to the location you want. Then release the click. In addition to editing their layout in the sidebar tab, rearranging the order of the goals also changes their position in the results tables. To associate new goals, click “Associate a new goal”. The button is then replaced by a drop-down menu containing the created goals set on this website that are not yet associated with the test. Select the goal(s) you want to associate with the test from those available in the list. Click “Validate” to confirm the modifications or “Cancel” to close the pop-in without taking these modifications into account. The “Variations” tab allows you to view the main information about the variations of the test and to modify the allocation of the traffic. The set of variations created on the test are listed here and recognizable, as on the rest of the results page, by the colors associated to them. The first variation of the list (black) is the original. Under the name of each variation, you find the traffic rate allocated to it. If you have hidden a variation (“Actions on the results page”) of the results page, this is indicated as “hidden”. If you have disabled some variations, they appear after online ones. Note: A variation is considered disabled when it has been de-selected from the graphic editor or when 0% of the traffic is allocated to it. The traffic excluded from the test is displayed at the bottom of the tab. To change the allocation of traffic, click “Edit”. A pop-in appears and allows you to change the traffic allocation for each variation associated with the test. Define the distribution of traffic between variations in the same way as on the editor. Click on the icon to view the variation in a new browser tab. The icon tells you that you can deplace it in the list of variations. To change the display order of the variations, move them one by one by drag and drop: click on the variation you want to move and, while holding your click, drag it to the location you want. Then release the click. In addition to changing their layout in the sidebar tab, rearranging the order of variations also changes their position in the results tables. The “targeting” tab allows you to view the conditions for targeting your experience and to modify them. In the same way as in the step of finalizing your experience, you find here the targeting conditions that apply to it. To change the targeting conditions, click on “Edit”. A pop-in containing the segment builder opens to change the targeting conditions in the same way as when you complete a test. To learn how to use the builder segment, see the dedicated article . Note: If you modify a segment also used on another experiment, this one is duplicated so as not to disturb the other experiments. In this case, an informative message appears at the bottom of the pop-in. The “Reporting tools” tab reminds you of the tracking tools you selected in step 3 of the finalization. To add new reporting tools, click “Edit” at the bottom of the tab. A pop-in opens with the list of reporting tools configured on your account. Note: Only reporting tools configured with your account are displayed. To set up new reporting tools, see the dedicated articles. If the available tools are numerous, a search bar appears and allows you to easily find a particular tool. Check the reporting tools you want to associate with your experience and click “Validate” to confirm the modification. The “History” tab keeps track of changes made to the test. The tab is similar to the “Timeline” page in your personal space, with the difference that you will find here only the actions made on the test. By using the bayesian method of reporting, you are trusting a deductive solution of data analysis. Results are generated faster than with the classical method, and are just as safe, which is ideal for users with low traffic or urgent tests to come up with solutions to their A/B comparisons. This method combines the actual data generated by the test with the a priori knowledge coming from prior studies or experts opinion. It provides an a posteriori information such as the estimation of future values for the conversion rate and the improvement rate. This anticipation of tendencies is called « Forecast » on the reporting page. When you click on « View results » from the Dashboard, you access to the classical reporting page by default. The Bayesian button is placed at the top of your results page. To access to the results generated by the bayesian statistics, just switch to “ON”. Structure of the Bayesian reporting page is quite similar to the classical reporting page. However, some elements differ from it. New indicators appear such as the probability to beat the orginal, the reliability of results according to Bayes, and the idea of forecast. Several graphs will disappear on this page, and the conversion rate alone will be displayed. This is the probability that a variation has to beat the original page with a higher conversion rate on a given objective. In the case where the traffic allocated to the original is 0%, the variations, thus sharing 100% of the traffic, do not compete with the original anymore. We will then talk about the « Probability to be the winning variation ». It corresponds to the confidence rate attributed to the results. The rate is calculated on a 3-level scale, which is easy to interpret thanks to the legend that automatically appears in the “Reliability” column of the result tables. The results are completely reliable once the 3 squares are full: this means that the reliability rate has stabilized over time. Be careful, to guard against any reversal of trend, it is advisable not to exploit your results before reaching a sufficient reliability rate. Forecast is the anticipation of a value to which will converge the results. This data is only available for both conversion rate and improvement rate. Forecasting a future value requires to collect a certain amount of data, so this indicator may not appear the first days after the launching of the test. 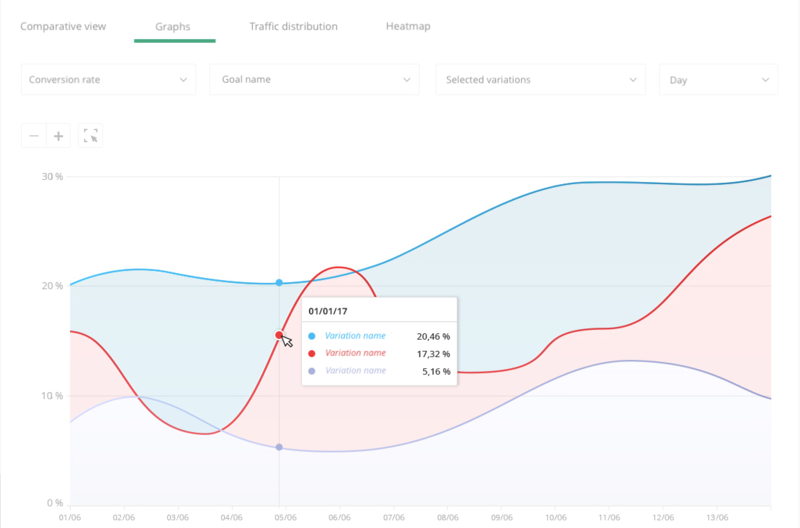 The forecasts appear directly on the table board, after the actual values of the conversion rate and improvement rate. The value forecast also appears in the conversion rate graph, it is located in the grey area on the right. It is symbolized by a circle, and takes the color of the variation it represents. 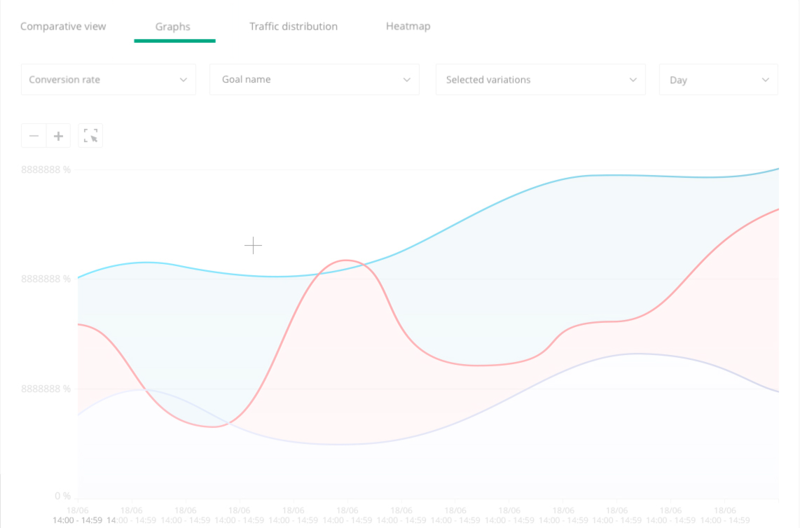 Use the dotted horizontal lines to compare the actual evolution of your conversion rate with its future value. My results are very different, is it normal? Both statistical methods lead to equivalent results, but they do not insure a perfect similarity between the two. It is thus normal that you happen to observe differences between some rates. In some cases, two different variations can be announced winners on a same test. Make sure that the trust rate is at its maximum in both methods before comparing the two data. If they are and that the doubt remains, then we advise you to use the results of the classical method. What is the statistical significance ? Z-score is a statistical measurement allowing to determine the validity of the results of a variation and if a variation is more or less efficient than the reference. For further information about z-score, you can read the Standard score article on Wikipedia. For example, if the statistical significance of your test is 90%, it will mean that the variation has 90% chances to beat the original, but there is also a 10% risk to be wrong. In this example, variation 1 is more efficient than reference variation, but is your test significant enough? By calculating the statistical significance, we notice that variation 1 is more efficient than reference variation and that significance is 96%: your A/B test is a success! You can now use variation 1 as reference. If you are using Google Analytics or Kameleoon as reporting tool, Kameleoon will calculate automatically the significance of your test. In Google Analytics, you will only see the conversion rate for each goal, but you cannot know easily which variation is the most efficient. Kameleoon calculates automatically the z-score, allowing you to check if your results are significant and if your variation is more or less efficient than its reference. You can see these measurement in your personal space. To do this, you must be logged in on your personal space. Once you are logged in, click on the “All tests” button. Then, click hover on the test card and lick on “View results”. The reliability rate, or statistical significance. In the example below, the reliability rate is 99%. Note: This indicator makes it possible to visualize, immediately and very easily, the evolution of the reliability. Just watch the boxes. You can also consult the graph showing the evolution of the reliability over time, by selecting “Reliability” in the “Graph” section of the block. You can do it on the “Graph” section of the page or by displaying the graph in specific goal table. Then choose to display the reliability rate on the graph. When the curve flattens, it means that the results of your test are stabilized and that you can use this data with confidence. Pages/Screen per session: the user’s interactions will be considered a conversion. To use this type of goal, you must configure at least one event. Click on “Continue” to define your goal details. In our example, we have selected the “Destination” type for our goal. First, indicate the title of the report and the type of report to generate (“Explorer”, “Flat table” or “Map Overlay”). Fill out the metrics in the “Metric group” part. To finish, add a filter containing the name of your test. This will allow you to obtain only the result of the A/B test. Click on “Save” and you will obtain a custom report with these data. Universal Analytics is the new version of Google Analytics. One big difference is the replacement of custom variables by custom dimensions. It is now necessary to declare in Universal Analytics the use of each custom dimension for A/B testing, otherwise the results will not be easy to reach – which is another big difference with Google Analytics. If Universal Analytics registers datas from more than 1 test, you have to create one new custom dimension for each test or your results will not be relevant. You are a ContentSquare customer? When you create an A/B test with Kameleoon, you will now be able to read your results in ContentSquare. The first step is to install ContentSquare. Log in to your personal space at https://back-office.kameleoon.com, click on “Configuration” and then “Integrations” in the sidebar. For more information on this page, see our dedicated article. Click on the “+” next to ContentSquare to configure it and add it to your integrations. Once the menu unfolds, click on the “Activate tool” button. Select from the list on the left the website(s) for which you want to configure ContentSquare. Finally, click on the “Validate” button to add ContentSquare to your reporting tools. When finalizing your test, click the “Tracking and Goals” step to configure ContentSquare as a tracking tool. A pop-in opens where you can choose the tool. Click on “ContentSquare” to move the toggle to “ON”. You just have to validate your choice. ContentSquare will be mentioned in the summary pop-in before going live. 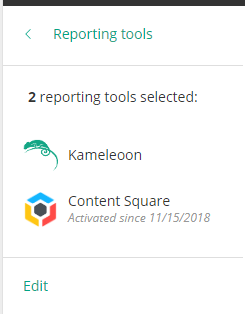 Kameleoon will automatically transmit the data to ContentSquare and you will be able to view your results directly in the tool. Once Content Square is defined as a reporting tool for an A/B test, you can select (or unselect) it via the A/B results page. To do this, click on “Reporting Tools” in the right panel to open the corresponding menu. The reporting tools associated with the test are displayed. Click “Edit” to edit this selection. You can then select or unselect ContentSquare. Then click on “Validate” and continue to finalize or update your A/B test. In Contentsquare, you will be able to segment your visitors based on the Kameleoon tests and variations they have been exposed to. These segments are usable in the set of Contentsquare analysis modules. To access results on ContentSquare, log in to your dashboard. First of all, you need to activate heat maps as a reporting tool from your personal space in order to add it to the list of your reporting tools. When the tool has been configured, you will be able to select it when you launch your tests. To do so, log in to your personal space. 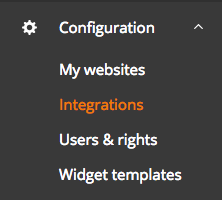 Use the left menu to go to the “Integrations” page. Click on the “Heat map” icon to activate heat maps. Fill in the width of your website, in pixels (for example, 1024 px) and validate. Now the tool is set up for your website, you can use it when you launch your tests! Before launching your test, in the “Finalization” menu, you can select the reporting tools of your choice in step 3. Check the “Heat map” box. Note that you can add as many reporting tools as you want. You can activate the heat map with one or several other reporting tools. 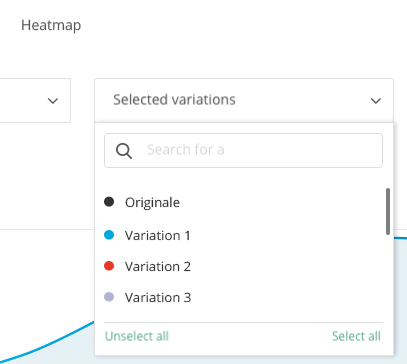 Once your A/B test or your personalization launched, you will be able to consult the heat map by variation.These are accessible from your personal space and on the results page of your experience. Once connected, click on the “All tests” button, or use the left side menu to go to the “Overview” page. On hover on the test card, you will see “View Results”. Click to access the associated results page. The heat maps are shown on the results page (if you selected HeatMap as a reporting tool; if not, it displays an error message). Click on the “Heatmap” tab to display the map associated with each variation. Note: Heat maps do not take into account filters and periods that you may have defined in the display settings of your results. By default, the right field indicates the URL that you specified in the editor. You can edit this information to display heat maps associated with another URL. In this case, the data will update automatically. Access the settings menu by clicking on the icon . Via this menu, you can adjust the sensitivity (in order to easily identify the areas that attract the most clicks), the size of the points (increase or decrease their diameter) and the opacity (adjust the degree of transparency/opacity of your color) of your heat map. A simple click also allows you to open the map in a new tab. Finally, you can compare the heat maps of two different variations. To do so, select two variations in the dedicated menu and the cards will be displayed next to each other. Log in to your personal space on https://back-office.kameleoon.com, click on “Configuration” and then “Integrations” in the sidebar. If you search “smarttag” (with or without space, with or without capital letters), the tool “AT Internet – SmartTag” should be displayed in the search results. The tool “AT Internet – SmartTag” will be available to users of every subscription type (A/B Testing, Personalization, Predictive), except Freemium. By default, the tool is not installed. To use SmartTag, the first step is to activate “AT Internet – SmartTag” on the Integrations page. With a click on “Install the tool”, you will be able to select the websites on which you want to activate it, and indicate the SmartTag variable(s) you are using for your website(s), so that information can be correctly reported to AT Internet (the same already applies for Comscore and Ysance). When selecting a website, you are asked to inform Kameleoon about the tracking variable it should use. If you select more than one website, a checkbox appears “Use the same setting for all selected sites”. By default, the box is checked. If you leave it checked, the same tracking variable will be used for all websites. If you uncheck the box, you will be able to switch between all selected websites in the drop-down list at the top. You will have to give a variable for each selected website. Once you have configured the tool and click on “Validate” in the bottom-right corner, the configuration panel closes. You will then see a “ON” toggle on the right of the tool’s line, as well as the number of websites the tool is configured on. Once AT Internet – SmartTag has been activated on the Integrations page for a website, it has to be displayed in the “Tracking and goals” pop-in in the Graphic Editor. If you want to select it for an A/B Test, you can just click on the toggle – you have nothing else to parameter at this point. Once AT Internet – SmartTag is added, it is then displayed in the “Test summary” pop-in. Once AT Internet – SmartTag has been chosen as tracking tool for an A/B Test, it appears in the Reporting tools list on the right-hand side of the test result page. If you click on “Edit” you will access a pop-in where you can manage the used tools for this A/B Test. AT Internet – SmartTag should also appear on this list. On the SmartTag dashboard landing page, you’ll find general information about your audience: the number of visits, the number of page views, the bounce rate, the average time spent per visit, and the number of pages viewed. To access your tests’ results analysis, go to the “Content” section of the menu, then to the “MV Testing” section. The list of your tests appears in the table at the bottom of the page. On the graph above, the curves represent the he selected tests’ results evolution. Clicking on the arrow on the left of the test title, a diagram is displayed showing the number of visits generated on the reference and the tested variations of the page. By clicking on the test name, you can display the detailed results. The graph on the top of the page shows the evolution of visits over time for the different versions. The table below shows the detailed results for each version tested.